Some people like to go shopping the day after Thanksgiving, but here at the Daily Turismo, we don't waste our time waiting in some epic line at Walmart for some huge piece of touchscreen technology -- instead, we blow our hard-earned cash on a piece of automotive art, maybe a classic designed by Paul Bracq? 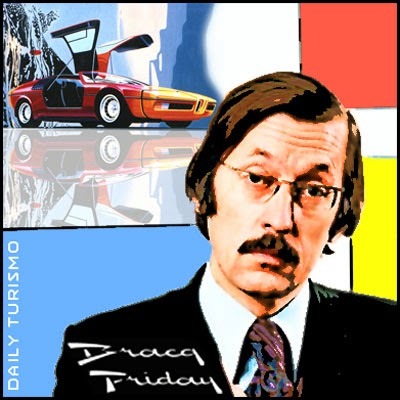 That's right...it is time for DT's annual celebration of Bracq Friday. Paul Bracq is a French born mustache enthusiast who created the graceful shape of icons like the BMW 7-series, 6-series, E21 3-series, MB W113 SL, W108, W100 (aka 600 or Großer Mercedes) W111, W114, multiple Popemobiles and the French TGV high speed train. You can read more about the man here on his website PaulBracq.com or a summary of his accomplishments in this Petrolicious article. Oh yeah, he's also an accomplished painter. Now an octogenarian, he's created Les Ateliers Paul Bracq in Bordeaux as a full-service restoration shop for the classic Mercedes-Benz cars that he designed in the first place. With a resume like that, we can't help but assemble a virtual collection of his best automotive work. BTW, my starter went out on the X5 and the family had to take the $500 e34 this holiday 300 miles around Socal. Ran flawlessly, however no A/C in 91 degree temps. My wife was not that happy. Jealous of the $500 E34 and the 91 degrees. Been raining here in Vancouver for 2 weeks straight. Is the roof painted? Thanks paulmar, It's just a vinyl sticker. Bracq Friday is my favorite!